In 1836 America was celebrating its 60th birthday. It was the first year since 1800 that John Marshall was not Chief Justice of the Supreme Court and Andrew Jackson was President. The entire country (at that time 24 states, 25 by the end of the year) was absorbed in the events taking place in the southwest. Starting on February 23rd a force of 187 defended the Alamo against an army of nearly 4,000 led by President Antonio Lopez de Santa Anna. The fighting lasted until March 6 when the last defender was killed in hand to hand fighting. On March 27th Santa Anna’s forces at Goliad massacred a force of about 350 Texans. The Mexicans were defeated and Santa Anna captured near the San Jacinta River by a force led by Sam Houston on April 21st. On May 31st john Jacob Astor’s Astor Hotel opened in New York City. James Madison, one of the authors of the Constitution and Bill of Rights, and 4th President of the United States, died at Montpelier, his estate in Virginia, at the age of 85. In other events during 1836, Roger B. Taney was appointed as the 5th Chief Justice of the Supreme Court; Congress had heated debates over the question of slavery, Aaron Burr, Thomas Jefferson’s Vice-President, died at the age of 80; Arkansas was admitted as the 25th state, Martin Van Buren was elected the 8th President of the United States, and Michigan was allowed to vote in the presidential election even though it did not become the 26th state until 1837. It is interesting to note that Martin Van Buren was the first president born after the Declaration of Independence was signed. At this point, it had been only 37 years since the Father of our country and first president, George Washington, had died. All of these events are chronicled as a part of our country’s history. While all of this was going on, an event occurred in Ebensburg, which has developed into an important part of our everyday life and a source of community pride. On July 25, 1836 the Ebensburg Borough Council passed an ordinance creating the organization known today as the Dauntless Fire Company. The borough’s first attempt to provide fire protection occurred in 1825 when Jeremiah Ivory and Owen McDonald were appointed fire wardens. The function of the fire wardens was to organize and direct the fire fighting efforts of citizens responding to the cry of “FIRE”. It appears that Ebensburg has had a continuously active fire fighting force since 1826, but the group had no official name and was known simply as “firemen”. On September 5th, 1825 J. Evans, J. Moore, and J. Ivory were appointed to a committee to place the borough ladders in proper situations, in the event of fire, and “have the care of them for the balance of the year”. The borough council voted on March 28, 1826 to buy four fire ladders, two were 26 feet long and two were 18 feet long. Also on this date James Rhey, Burgess of Ebensburg, appointed Jeremiah Ivory and Owen McDonald as the official firemen of the borough. There has been a fire fighting organization in the borough ever since. We don’t know about Mr. Ivory but Mr. McDonald continued until 1832 when James Rhey was appointed fireman in place of Mr. McDonald on April 18, 1835. The following information was compiled from Borough records, news articles and Fire Company minutes in an effort to highlight important and interesting events since 1836. $112.50 cash plus $125.00 payable in one year with interest. $250.00 payment in one year with interest. July 25, 1836 – With the purchase of a fire engine it was felt formal regulations should be drawn up for the fireman and an ordinance for regulation of a fire company was passed by the borough council. The fireman of the community now had official regulations and a chain of command. The reorganized firemen, now a fire company, were known as “The Ebensburg Hydraulic Company”. When the new fire engine arrived it was promptly dubbed “the squirt”. The squirt is kept on display in the present fire hall. January 30, 1846 – Although this date may not be correct it was about this time that the fire company reorganized and took the name “Friendship Fire Company”. Ebensburg had the distinction of having a “fire-fighting machine” which was also used as a tourist attraction. It was displayed at the “engine house” where the present Cambria County Court House now stands. At that time the county’s second courthouse was located at the northwest corner of the present courthouse square, having been completed in 1830. By 1849 the second jail had been erected on the southwest corner of the present courthouse square. October 8, 1851 – 5:00 A.M. fire destroyed a stable belonging to James Rhey. According to the Mountain Sentinel “The engine was brought out and did excellent service in arresting the progress of the fire, and it was mainly from this source that the stable and carriage house of general McDonald were saved”. If this stable and carriage house had caught fire “one half of our town might have been destroyed.” It was suggested that the fire was “for the purpose of attempting a rescue of the prisoners in the jail.” Mr. Rhey offered a $200.00 reward for the arrest and conviction of those responsible for this fire. May 16, 1853 – A large tannery on the west end of town was destroyed by fire. Misters Evans, Harr, and James owned the tannery. Because of high winds it was feared the town would be threatened. 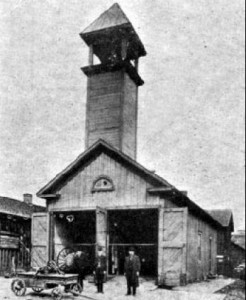 Mr. Andrew Rhey, editor of the Mountain Sentinel noted that “the small engine…was of much service” but called for reorganization of the fire company and the purchase of additional apparatus. July 20, 1854 – Chimneys and stovepipes running through the roofs of all buildings in town were inspected and most were found to be unsafe. There is no mention that this condition violated any ordinance. June 11, 1856 – The house owned by Philip Schettig was lost in an early morning fire. May 6, 1857 – A fire at the home of A. A. Barker was extinguished with no damage done. December 23, 1857 – The 4 year old child of A. J. Hite died in a fire at his home on Locust Street at approximately 7:00 P.M.
February 15, 1860 – Fire at the east end of town at the home of John Thomas. The engine was brought to the scene but froze up. Citizens turned out for a bucket brigade and saved the house. October 31, 1867 – Cambria – Freeman, Ebensburg, “THE FIRE FRIEND IN EBENSBURG” – Four Conflagrations in three days – Our town during the past week has been pretty severely scourged by the devouring element, no less that four fires having occurred in the same locality within less than three days, three of them in fact within twelve or thirteen hours of each other. Two of these conflagrations resulted in considerable loss, but it is less cause of wonder that the properties in question were destroyed than that those surrounding and in the immediate neighborhood were saved from a like fate. Only the favorable conditions of the weather and the almost superhuman efforts of our citizens served to stay the destroying element and confine it within the comparatively small limit which it laid waste. The first fire broke out on Thursday afternoon and for a time threatened the most serious consequences. Thomas Class while in the pattern department of his father’s foundry, in the west end of town, cast his eyes toward the roof, to his horror discovered fire between the shingles and boards which line the roof. Without delay he gave the alarm, which soon spread through the streets. In short time people were upon ground with buckets and other vessels, in a few minutes the flames were subdued after burning large holes in the roof, and charring several valuable patterns. On Saturday afternoon citizens were again startled by the cry of fire. This time it was discovered issuing from the stable of E. P. Tierney Esq. who resides in the next house, adjoining the foundry property. From Mr. Tierney’s stable the flames communicated to stables of Mr. John Griffith and Mr. Isaac Evens. By the time an effective force of workmen reached the scene the three buildings were so completely enwrapped that it was worse than useless to attempt to save either of them. All efforts were directed to the preservation of the house and other buildings in the immediate vicinity. Skillful firemen applied water in such a way as to affect the desired object, although it was a matter of conjecture we shall not attempt to advance any hypothesis on the subject. We did not learn the amount of the loss. Scarcely had this fire been rendered harmless for further mischief and greater portion of citizens returned to their houses and places of business when still another cry of fire resounded through our streets. This time flames were seen emerging from the rook of Mr. Williams Mills house, the next one below the burnt district. The startling summons about 5:00 Sunday morning called our citizens from their beds to witness the burning of still another building in same locality and occupied as a weavers shop by Mr. John Williams. The building, a small one and half story frame, was quickly wrapped in flames beyond the control of human efforts, as in case of stables. All attention was turned to saving of other tenements. Question, how did this fire occur? The announcement that a couple men prowling about the vicinity and acting very suspicious after the fire broke out and the conviction settled in minds of a few, that they had set the building on fire and more still account for their conduct in other ways. Be this as it may the destruction was complete and the loss has fallen upon persons who were not prepared to bear it. June 10, 1870 – The planing mill belonging to A. A. Barker, located at the east end of the borough, was entirely destroyed by an early evening fire. It was supposed that a spark from a furnace started the fire in the sawdust and had smoldered for some time. The building and contents were destroyed and a large amount of lumber was destroyed. During 1870 a fire prevention campaign was organized to see that all defective flues, stovepipes, chimneys, etc. were in good repair. 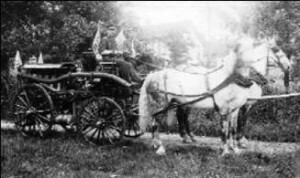 December 20, 1870 – A committee was appointed to sell orders (bonds) to purchase a second hand suction pump fire engine, along with 250 feet of hose at a price of about $250. A tax of 10 mills was levied to repay the orders. It was reported in mid January 1871 that the borough council had contracted for the purchase of a used suction fire engine and 200 feet of new rubber hose for $1200. The engine was expected to be delivered at about that time by Mr. R. C. Elliot from Pittsburgh. During the 19th century and much of the 20th century the business of the fire company was the business of the borough council. It was the council that purchased equipment for provided funds for the fire company to make purchases. The fire company was authorized to use the fire fighting equipment. Actual possession of the equipment shifted back and forth between the company and the council at the discretion of council. Council or the Burgess appointed the firemen. Records show the names of those appointed until the system was changed in the early 1870’s, when the fire company elected their own membership. Each attempt to reorganize the fire company or to organize the fire company differently appears to have been an effort to make the fire company a stronger and more effective organization. It was in the 1870’s that a stronger and more independent fire company began to emerge. With the pending delivery of a more modern fire engine in early 1871, it was felt that a reorganization of the first fire company was in order, especially since the new engine would require many more men that had been appointed to handle the old engine. At this point the old engine was still “the squirt” purchased in 1836. February 8, 1871 – Council passed a resolution giving the fire commissioners authority to enroll firemen and organize the fire company to take charge of the new apparatus. At this time the fire company was known as Victory Fire Company. It is not clear however whether this name change was effective in 1871, or earlier, in the 1850’s. At this point however firemen were still appointed. Various articles at this time also refer to the Dauntless Fire Co.
February 27, 1871 – Mr. Elliot appeared at a meeting with council and sold them a new pump instead of the old pump ordered. Even though there was difference in cost, council could have the new engine if the agreed to pay the freight cost which they did. The new engine was described as a “rather elaborate looking affair, having brass bells, numerous curves, and trimmings”. The pump required 12 to 20 men to operate it and would throw a stream of water over the tallest building in town. The borough maintained possession of this engine until Mr. Daniel Griffith and Mr. Abner Francis dismantled it in 1908. The engine cost the borough $1200. March 3, 1871 – C. T. Roberts, B. R. Davis and William Sechler were appointed to investigate the possibility of building a new engine house on Market House Square facing Crawford St. On April 20, 1871 Mr. Richard Tibbot was awarded the contract for the new engine house and council chambers on a low bid of $570. The old engine house was sold to Evan Griffith for $15,000. The new engine house and council chambers was built on Sample St.
February 2, 1872 – A reorganization meeting was held in the grand jury room of the courthouse. A committee was appointed to draft a Constitution and By-Laws for a meeting on February 6th. February 3, 1872 – On this date or Jan. 2 1872, fire destroyed a large stable in the center of the business district, at the residence of ex-sheriff, James Myers. The fire was described as “involved in mystery” and that someone with no business there had intentionally or carelessly started the fire. February 6, 1872 – The constitution and by-laws drawn up by the committee were adopted. The constitution identified the company as the “Dauntless Fire Company Hook and Ladder and Hose Company of Ebensburg”. A suggestion was made at this meeting that the organization should be chartered and a committee was appointed to accomplish this. The company was soon incorporated. Under this new format the fire company could enroll members and membership was not limited by appointment by the borough council or the burgess. March 15, 1876 – The first water mains were laid including 15 fire hydrants. Council passed a resolution prohibiting the use of fire hydrants for any purpose other then extinguishing fires. October 1, 1875 – Company met in a special meeting on the question of changing the regular meeting night from the third Saturday of each month to the third Monday of each month. October 18, 1875 – The question of changing the regular meeting night was put to the company and the motion to change was defeated. November 20, 1875 – Saturday. At a regular meeting the resolution to change the regular meeting night to the third Monday of each month was again brought to the floor. The resolution passed. The next meeting was Monday, January 17, 1876. June 18, 1888 – A resolution was adopted to change the constitution to make the regular meeting night the third Tuesday evening of each month. The meeting night has remained the same since then. June 16, 1891 – A committee was appointed to obtain prices of a new steam engine. This action was taken because the equipment then in use failed to function properly while being tested by the fire company on May 21, 1891. April 13, 1906 – The worst fire, up to this time, occurred on this date. A large sawmill and planing mills of Webster Griffith, located near the Ebensburg Depot were destroyed. William Makin, the plant watchman, perished in the flames. The fire was discovered at about 3:45 A.M. Although it is reported that the fire department responded within a few minutes, the fire had a good head start. October 5, 1908 – Monday. About 2:15 A.M. fire was discovered in the rear of Owen Jones’s grocery store. 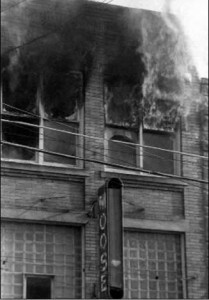 The fire soon spread to the bar room of the Central Hotel then to an unoccupied storage building of J. G. Hasson, W. C. Shields Grocery, and the C. F. Roberts store and residence. Strong winds swept the flames across Julian Street to Mrs. J. C. Blair’s residence and C. J. McAnuly’s livery and also the Edward Griffith residence. This was one of the worst fires in Ebensburg. Calls for assistance were sent to Johnstown, Altoona, and Carrolltown. Johnstown and Altoona were stopped before they arrived. The cause of the fire remains a mystery since no fire had been burning in Jones’s furnace since Saturday and all other buildings in the area were heated by steam from the Ebensburg Light, Heat, and Power Co. Plant. 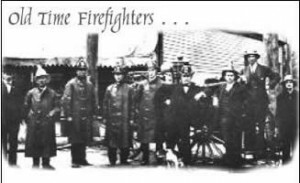 September 1909 – The Dauntless Fire Company and the South Fork Fire Company pioneer in a movement to form a Cambria County Volunteer Firemen’s Association. April 12, 1910 – About 11:00 P.M. and explosion shook the buildings near the corner of Main and Julian Streets. The fire apparently started in the rear of Huntley Hardware and spread to Dr. Griffith’s building, Mrs. Jones Millinery Store and residence, Schettig’s Hardware and the Exchange Hotel. Seven firemen were injured when a wall of Huntley Hardware collapsed. Cresson, Barnesboro, Carrolltown, Johnstown, and Altoona provided assistance. The cause of the fire is unknown, but it was felt that burglars might have blown the safe, which started the fire. The building was heated by steam from the electric plant, there was no gas in the borough at that time and only a small amount of dynamite and black powder was kept in the store. 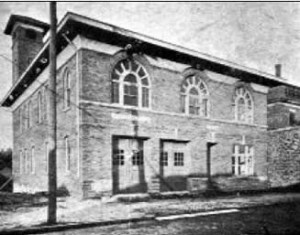 September 21, 1910 – The County Firemen’s Convention was held in Ebensburg. Dauntless distinguished itself by taking first prize in four contests. February 18, 1915 – The worst fire in Ebensburg’s history occurred on this date. Eleven buildings and residences were destroyed along with twenty-six businesses. Mrs. M. J. Stolty, of the Mountain House, reported the fire and the alarm was sounded at about 4:00 A.M. The Dauntless gas engine burst a cylinder becoming disabled and gravity flow would not move water above the first floor. Assistance was requested from Johnstown. Their equipment arrived about 7:00 aboard a train provided for the purpose by the Southern Cambria Railroad. The fire started from an unknown cause, in the J. B. Denny Poolroom in the Mountain House and spread along Center St. In an effort to stop the spreading fire C. J. Brown’s newsstand was dynamited but this action did not help. Newspaper accounts report that the large amount of open space around the Cambria County Courthouse saved it from the flames. L. M. Keller, Chief of Johnstown’s Fire Dept., assumed control of the fire ground when Dauntless Chief was injured. Damage was estimated at $200,000. Injured were Dauntless Chief, Fergus C. Lloyd (cut about face and burned), Leo McKenrick, and Dwight Davis (both minor facial and hand cuts). Fire company records indicate that the company was quickly on the scene and it appeared the fire was nearly extinguished with minor damage when the engine failed and the fire flared up again. 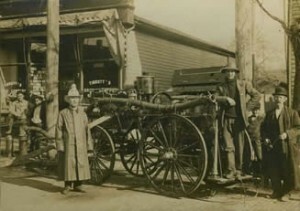 Following this fire an engine from Johnstown with an operator was stationed in the Dauntless Fire Hall and the borough ordered a new Waterous engine. April 1915 – The company purchased the lot beside the Municipal Building on Sample St. for $2000. December 4, 1916 – The Cambria County Court, upon petition ordered and decreed that “the Dauntless Fire Company, Hook & Ladder & Hose Company of Ebensburg, Pennsylvania … shall hereafter be known and designated by the name of DAUNTLESS FIRE COMPANY of EBENSBURG, PENNSYLVANIA”. March 20, 1917 – The company voted to have council purchase double 35-gallon chemical tanks on a Ford chassis for $845. July 15, 1924 – The company voted to become a member of the Central District Firemen’s Association and elected Delegates to attend the convention in Patton, August 20-24. February 28, 1927 – The first traffic light was installed in the borough on a 30-day trial basis. September 20, 1927 – A one tom Dodge truck chassis was purchased from Ebensburg Auto Co. for $1,300. 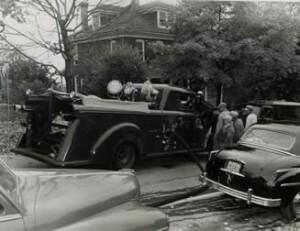 Burley and Seymore of Carrolltown built a hose body. May 14, 1928 – A new American La France, 500-gallon engine was purchased for $6,750. July 1-2, 1929 – Central District Firemen’s Convention held in Ebensburg. Fall, 1936 – The company purchased a 1936 Dodge ladder truck. October 21, 1941 – Decision to purchase a new American La France Engine, with a 12-cylinder engine, 500 g.p.m. pump, without ladders or a booster tank was made. July 19, 1949 – a quote accepted on a new engine from American La France. June 15, 1952 – Proposal to purchase a 1952 American La France engine for approximately $11,000 was accepted. December 15, 1952 – Company voted to purchase a truck to carry the oxygen tanks. June 21, 1955 – Truck committee proposed the purchase of a new 750 g.p.m. engine. December 18, 1956 – Ladder Truck committee proposed the purchase of a GMC chassis F375-8 from Falchini Motor Co. for $2580.87. 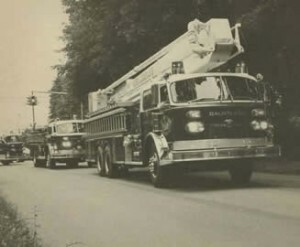 January 15, 1957 – Contract awarded to Brumbaugh Body Co. to build the body for the new ladder truck. August 29, 1959 – A 1956 American La France engine picked up in Elmira to replace the 1952 engine. July 1, 1963 – Purchased a 1959 American La France engine to replace the 1956 engine. February 1964 – The Borough office moved to new Municipal Building. December 15, 1964 – The fire company learned they were a beneficiary in the will of Allen A. Barker. March 16, 1965 – Decision made to trade in the 57 GMC chassis on a 1965 GMC chassis from Falchini Motors. Brumbaugh Body Co. renewed the old ladder body to be put on the new cab and chassis. April 18, 1967 – The company voted to trade the 1959 engine on a new American La France engine. November 2, 1967 – Company voted to again purchase the property next to the old borough building, this time from the Cambria Theater Co. The Property was purchased Nov. 8, 1967. April 16, 1968 – the new engine purchased from American La France to replace the 1959 engine was placed in service. November 21, 1970 – Converted Cambria Theater building. Dedicated with an open house on November 21 and 22. March 16, 1971 – 10% down payment made to Swab Wagon Co. on a new rescue body. Also voted to purchase a GMC cam and chassis from Falchini Motors for the rescue truck. September 22, 1971 – New rescue truck picked up from Swab Wagon. September 28, 1972 – A bid was awarded to American La France for a 1973 engine. February 20, 1973 – The first tanker was put into operation. The tanker was a used army truck purchased through Civil Defense for $125 to which the company added a used gasoline tank body purchased for $100. Company members did all the work, with materials donated by Bethlehem Steel. June 18, 1973 – New 1973 American La France engine picked up at Elmira, N.Y.
New turnout gear was issued, and it was made mandatory that all members had to be fully dressed in protective clothing to respond to any alarm. August 21, 1973 – A truck committee appointed to draw up specifications for a snorkel. November 20, 1973 – Project completed to place new hydrants throughout the borough. March 19, 1974 – An air operated rescue air chisel tool purchased. May 21, 1974 – American La France was awarded the bid for a 75-foot snorkel with a 1500 g.p.m. pump. The contract specified delivery in 400 working days. July 15, 1975 – The company purchased a 1926 American La France engine from St. Francis College. March 16, 1976 – New radio code was adopted by Cambria County. July 20, 1976 – Formally adopted the designation as station 22. August 17, 1976 – Company decide to spend more money on fire prevention rather that fire suppression. August 19, 1976 – The new snorkel was picked up from the factory and training with it began. July 5, 1977 – Approved the purchase of a 1969 milk tanker to be outfitted for fire company use as a tanker. October 18, 1977 – Sold the 1936 Dodge ladder truck and sold the old tanker. November 15, 1977 – New (1969) tanker put in operation. January 17, 1978 – Hurst tool ordered. February 21, 1978 – Smoke and heat detectors bought for new and old halls. November 20, 1979 – Bid accepted from American La France for a new engine. April 15, 1980 – The 1968 American La France engine is sold to Wilmore. December 16, 1980 – New engine, 222, put into service. January 20, 1981 – Air truck, 226, is completed and put into service. January 29, 1983 – Rescue 224 taken to Swab Wagon to be refurbished. April 17, 1984 – Bid accepted from Falchini Motors for a cab and Chassis for a tanker. The old tanker body was refurbished and installed by Steeldraulics. November 20, 1984 – New tanker put into service. December 20, 1984 – 5″ hose replaced 4″ hose on both engines and the snorkel. The company purchased property behind the hall from Dr. Smith. 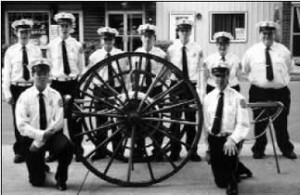 August 14-16, 1986 – The Dauntless Fire Company hosted the 94th annual Central District Volunteer Fireman’s Convention. June – New truck on order. June 16 – Structure fire at the Moose Lodge on Center Street . Eight fire departments battled this 3-alarm fire. July 1987 – New Saulsbury pumper delivered. August 17 – Structure fire at S & S Wood Specialties in the Industrial Park. 12 fire department battled this alarm for over 7 hours. September 11 – Structure fire at the John Salvetti Residence on East Crawford Street. John Salvetti was rescued from the garage by Police Officer Dave Roberts and neighbor Fireman Dean Damin. October 1987 – Dean Damin and Dave Roberts receive Valor Awards for their quick lifesaving effort at the John Salvetti house fire. They forced open a garage door and were able to pull Mr. Salvetti to safety. February – Ebensburg Borough turns over the old borough building to the fire company. August – Committee appointed to look into construction of a new fire station on the present land of the old borough building next to the current station. 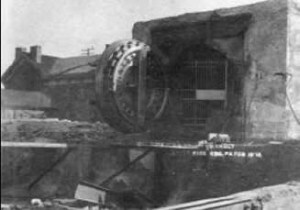 November – President James Gorchik is killed in a mining accident at Bethelem Mine 33. Vice President Oliver Link assumes the duties after this loss. November 3 – Reported airplane on fire near the Ebensburg Airport. Plane went down in the woods west of Revloc. Pilot was rescued by Dauntless firemen and Ebensburg EMT’s. December 7 – Structure fire at S & S Wood Specialties– 8 departments fought the fire for over 8 hours. December – New Officers Elected: President – John Hurley, Chief – Merle Link. January 10 – Structure fire at the Mini Mall in Ebensburg. Damage was over 2 million dollars. 13 departments assisted for over 12 hours. The Mini Mall was rebuilt and back in operation within 3 months. February – Plans are made to begin to build a new station next to the current station. April – Demolition of old borough building is started to make room for a new station. August – All meeting minute records, some dating back into the 1800’s, were microfilmed and placed into secure storage for safe keeping. October 10 – Structure fire – S & S Wood Specialties– fire went to 2nd alarm – on scene over 3 hours. February – Company purchases 14 MSA SCBA units. March 21 – Structure fire – Courtesy Promotions on South West Street – assisted by 6 departments – on scene for 5 hours. September 25 – Structure fire – Mini Mall above Yesterdays Party – 3 departments assisted – minor damage. January – County-wide 9-1-1 will soon be operating out of the PMC Building, taking care of all dispatching for fire, police and EMS. February – New phone system is installed in the current and new station. December – Bill Leary is elected as the new president of the company. February 13 – The furnace at Aquinas Hall at Bishop Carroll High School explodes and causes major damage. There is little fire but the floors on both the first and second floors receive major damage. February 14 – Assist Station 70 (Cresson) at the Cresson Summit on Route 22 with a major motor vehicle accident. Over 35 cars and tractor trailers were involved. 11 people were killed in the white-out condition. June – New Rescue 224 has arrived and is placed in service. July 30 – Assisted Roaring Spring (Blair County) at a structure fire at the Smith Transport Warehouse fire. Companies were on scene for over 10 hours. September – Dauntless Fire Company receives a Class 4 rating from ISO insurance agency. December 16 – Assisted Logan Township Fire Co. (Blair County) at the Logan Valley Mall fire. Bill Carlisle, Jr. becomes the Company’s first certified Fire Fighter I.
January – Congressman Shuster from Blair County presents the fire company with a flag that was flown over the Capital Building in Washington, for our help at the Logan Valley Mall fire. February 18 – Assisted Ashville Fire Company when a tow truck towing a garbage packer lost its brakes and rolled thru Ashville, crashing into Gibbons Funeral Home, killing one person and injuring three others. The funeral home was heavily damaged as the truck nearly drove completely through the building. August – Andy Kaza receives Valor Award at the Annual County Convention meeting. December – Ken Link is elected Fire Chief for the coming year. January – Dauntless members are part of a group of fire and EMS personnel that stage a mock accident that is filmed for use on the TV Show ER. Dauntless goes to Hollywood!!! Former Fire Chief William Battista is killed in an accident, when he had a heart attack and his car was driven into Lake Rowena. Scuba divers were called to pull his car from the Lake, where CPR was administered and Mr. Battista was flown by Med-Star to Conemaugh Hospital. September – Haz. Mat 1 finds a new home in Station 22. December 25 – Fire damages the Cambria Thrift building in downtown Ebensburg. 6 departments assisted at the fire. The building received moderate damage in the fire. February – New base station radio is purchased for the Station. April – John Hawksworth Jr. becomes the company’s first certified Fire Fighter II. June 25 – Charley’s Road structure fire damages house. 8 departments assisted for over 4 hours. August – Dauntless Firemen are awarded the Corbin Award at the Central District Firemen’s Convention. September – A group of local citizens ban together and raise funds through business donations to purchase an Argus Camera for the Department at a cost of $15,000. January – John Hurley takes over as President of the Company. March – Long-time member Robert Allison passes away. Bob was a long-time Fire Chief, Secretary and Trustee of the Company. He also served as Secretary of the County Association for 30 years. April – Tanker 227 is sent out to be refurbished at a cost of $64,000 at 4 Guy’s in Myersdale. July – Company purchases an emergency generator for the Station. This generator will run the entire station in the case of a large scale power failure. January – Committee is appointed to look into a Junior Firefighter program. New junior members could join at age 14 to 18. February – Company purchases a 60 KW generator to run the entire station in case of a power failure. Company purchases new Hurst equipment for the Rescue Truck, Maverick Combo Tool and duel line pump. 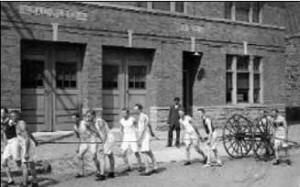 September – Frank Seymour from Loretto, donates Charlie Schwab’s original 1882 hose cart to the company. The cart will be repaired and placed on display in the Station. November 18 – Airplane down at the Ebensburg Airport – No injuries. January 11 – New Junior Members are taken into the company for the first time. January 16 – Motor vehicle accident at Route 422 and 219 – 4 people were killed in the accident. February – Snow mobile accident – Park Street Company donates $5,000 to the County Fire School Site for Cambria County fire school burn building– Prave Building Fire on South Center Street at the Cambria County Probation Office – 6 departments assisted at the fire that heavily damaged building. April 25 – Structure fire at the Rorabaugh Farm in Cambria Township. There were 2 fatalities. July – Dauntless is awarded the Fallen Fire Fighters Championship Award at the County Convention. Second Alarm Members. November 12. – Structure fire in the early morning hours destroyed the John Popovich residence on East Crawford Street. Mr. Popovich died in the fire. Company is awarded the FEMA Grant for New Gear, Air Packs and a New Radio & Pager System. February 19 –The first women accepted into the company as regular members. March – Company applies for a FEMA Grant for the upcoming year. April – Company receives an AED for use in emergency situations. July 8 – Plane down at the Airport. An experimental airplane practicing take off’s and landings ran off the runway. No injuries. September – A 2002 American LaFrance Pumber is purchased for $343,000. January – The new engine 22-1 has been delivered and training will begin on driving, operating, and the Class A & B foam system prior to the engine being placed in service. February – Motion made and passed to advertise bids for the sale of the 1981 American LaFrance. March – Training on the new engine has been completed and the engine placed in service. This will be the primary attack engine in the district and also back-up Rescue 22-4 for motor vehicle collisions. April – Motion made and passed to have Wasser Autobody perform minor repairs and paint work to the 1987 Pemfab/Saulsbury. The cost of this project is $3,000. Digitally Correct will re-letter the repainted portions when the work is completed. June – (20) new MSA S.C.B.A. have been placed into service following extensive training. Members will now have their own face piece. Anyone wishing to wear an air pack will be required to have annual fit testing, and S.C.B.A refresher training to maintain this qualification. August – Members of the Dauntless Fire Company win the Grand Champion Trophy for the second consecutive year. Dauntless Fire Company wins first place at the Central District Fireman?s Convention in Kane, Pa.
November – Fire destroys the Laurel Lounge Restaurant on West High Street. This two-alarm fire is ruled an arson. December – Andrew Kaza commented on retiring-trustee, Clyde Sheehan, for his many years of being both a fire and business officer, including that of chief. The membership gave Clyde a standing show of appreciation for his many years of dedicated service. January – Fire causes heavy damage at the Sutton residence on North Julian Street. No one was injured in the fire that caused major damage to the house. A PLCB liquor enforcement agent speaks at the regular monthly meeting regarding laws, and regulations pertaining to the upcoming Cambria County Fireman’s Convention being hosted by the Dauntless Fire Company. 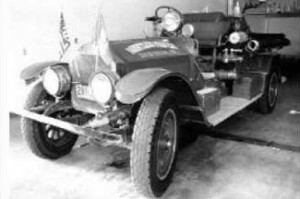 Chief Makin reports that the 1981 American LaFrance engine had been delivered to the Harmon Fire Department in Arkansas, and that full payment had been received. April – The new UHF radio system has been installed with a repeater being placed on the water tower in the Elderwood section of Ebensburg. This new system was funded by federal grant money and will upgrade communications of firefighters increasing safety. This cost of this project was $26,000. May – Dauntless Fire Company has 31 members with Firefighter I certification, qualifying them for having 50% of the active membership certified. August – Dauntless Fire Company hosts the 83rd Annual Cambria County Firemen?s Association Convention. Commissioner Ed Mann from the Pennsylvania State Fire Academy attends the convention meeting. Jackson Twp. Fire Company wins the Grand Champion Trophy during the convention. John Hawksworth and Dale Makin pass the Fire Officers I course. November – Two cars drag racing on Route 219 South caused an accident that killed 3 people. New AED put into service on Rescue 22-4. The existing AED will be carried on Engine 22-2. Training on firefighter safety including Personal Accountability Report (PAR), ID tags, Mayday. December – The new officers for 2005 were elected at the monthly meeting and sworn in by Mayor Charlie Moyer. Wayne Templeton is elected as the new President of the Company and Dale Makin is elected Chief. January – Motion made by Coleman Anna that the words “Under God” never be removed from the Pledge of Allegiance when spoken in this fire company. February – Dauntless Fire Company receives a $10,000 fire prevention grant, for the purchase of a fire safety robot. This grant was provided in cooperation with the Central Cambria School District. This new robot will be used during fire prevention activities involving children. April – The fire company receives recognition for their valiant efforts in rescuing a dog owned by Tricia and Eric Groer. The membership agrees to purchase a 2005 Dodge Durango from McCall Motors. This will be used by the elected company officers and will now provide 24/7 coverage using this new vehicle. Alarm cards will be adjusted and the on-call officer will handle many responses on a non-emergency basis. July – Formal training and implementation of firefighter rehabilitation program. This program was developed for the safety and protection of the firefighters. This was a joint effort by the Dauntless, Revloc, and Colver Fire Companies as well as Ebensburg Area EMS. August – Dauntless wins Grand Champion Trophy at the Cambria County Convention held in Jackson Twp. Greg Marshall receives a valor award. Greg is recognized for his life saving rescue of a trapped resident in an apartment fire. Greg is the ninth member of the fire company to receive the Valor Award. September – The company agrees to purchase (15) sets of bunker gear at a cost of $1,568.00 each. October – Commercial structure fire in the Industrial Park at the Gamesa Plant. Crews from (9) fire departments battled this blaze for 7 hours. The fire was on the roof of the structure and was extinguished using aerial devices. Dauntless Fire Company is requested to assist with the funeral services of brother firefighter Bob “Nute” Gallardy who was killed at the State Fire academy during a live burn evolution. Bob was a career firefighter with the Altoona City Fire Department and originally a native of Summerhill Borough where he began his firefighting career. Bob taught many classes at the Dauntless Fire Company and was a good friend to many of our members. November – Moment of silence was observed at the monthly meeting for Bob Gallardy and Tom Waltz, former fire chief of Nanty Glo Fire Department. Members assist Laidlaw Transportation with the annual Bus Safety Program and drills. January – Firefighters handle a vehicle accident with entrapment on the Colver Road. One female was killed, and one male severely injured. Both were flown from the scene by helicopter. Company agrees to form a committee to replace the Snorkel. February – Dauntless Fire company receives official notification from the Office of the Sate Fire Commissioner that all requirements have been met for having 75% of the active membership certified to a minimum of Firefighter I. Dauntless if the first volunteer fire company in Cambria county to attain this level of recognition. March – Truck committee has researched various types of aerial devices. Using the gathered information and the input from the membership, the decision is made to pursue a mid-mount type aerial, with a steel ladder construction, and a minimum length of 100 feet. April – Truck committee members begin touring the manufacturing facilities. Tours are scheduled for Smeal, American LaFrance, and KME. May – A fire at the William Leary Jr. residence broke out in the early afternoon. Revloc and Nanty Glo Fire Companies assisted Dauntless on scene. There were no injuries reported for this alarm. 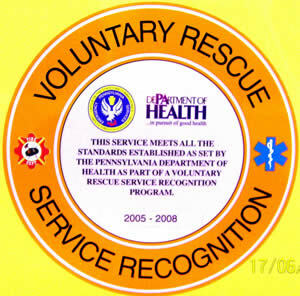 June – Dauntless Fire Company receives official notification that all requirements have been met for the Pennsylvania Department of Health, Voluntary Rescue Service Recognition. This is the first fire company in Cambria County to obtain the advanced level of recognition. August – Dauntless Fire Company is the Grand Champion at the Cambria County Fireman’s Convention in Nanty Glo. The general membership agrees to purchase a 100ft American LaFrance Mid-Mount Platform to replace the 1976 Snorkel. The cost of this project is $758,113.00. The Dauntless pumping team places first at the Central District Fireman’s Covention held in Lilly. September – The fire department administration is preparing the applications for loans to purchase the new aerial. Preparation continues for the upcoming fund drive. The new web site is presented by Shawn Dorsch at the department meeting. Correspondence from the Richland Twp Fire Co. is received thanking DFC for their assistance with standby companies during the recent loss of one of their members involved in a motorcycle collision. October – The membership agreed to sell the 1976 American LaFrance Snorkel to a private owner for a price of $32,150. The ISO inspection report has been received, and the department maintains a Class-4 rating. The department scored exceptionally well in apparatus maintenance, training and members response to alarms. December – Bill and Amy Leary extend an invitation to all members of the fire department in a house warming celebration. The Leary family recently moved back into their home after a fire earlier in the year. The annual Christmas dinner was held prior to the meeting. Election results for the 2007 officers were read. A total of 70 ballots were cast. Ebensburg Mayor Charlie Moyer administered the Oath of Office to the newly elected officers. January – New officers for 2007 take office on January 1st. The finance committee continues to seek donations to offset the expenses for Truck 22-3. A breakfast has been scheduled for March with Amici’s Restaurant to cater. The truck committee made a trip to the factory to review the progress and details for the new aerial. Dauntless assisted Summerhill FD with a working structure fire. February – Training on Truck 22-3 continues and to date, 24 members have completed the 24-hour training presented by American LaFrance. The company agrees to purchase airbags to replace those that have failed annual testing. These will be purchased from Kaza Fire Equipment at a cost of $4,037. A new projector will be purchased at a cost of $1012, this is part of a matching grant for $500 and will be used for training. Snorkel 22-3 assited Station 50 (Hope) with a working structure fire in the business district of Northern Cambria Borough. March – The company agrees to have a food booth at the drag races being held at the airport this summer with all proceeds going towards Truck 22-3. The annual banquet was held at the Imperial Room and 115 people attended. Pauline Reese and Beth Falchini were accepted as 2nd Alarm members.Truck 22-3 was put into service replacing the 1976 American LaFrance Snorkel. April – Ron Springer reported that Janet Sides and Beth Burkhart will be coordinators for 2nd alarmer. John Hawksworth Jr. continues to upgrade the historical cabinets with an antique fire extinguisher and items from the Snorkel. The new Hurst equipment has been installed on Rescue 22-4 and Engine 22-1. May – A group of firefighters are preparing for the FF 1 testing next month, a class was help in station to help prepare the candidates. Cambria 911 will be changing the way calls are dispatched to include Alpah, Bravo, Charlie, Delta and Echo, and Omega, depending on the severity of the incident. June – The first drag races were held at the Ebensburg Airport. Dauntless Fire Company provided fire/rescue protection, traffic control and worked a food booth for the afternoon. Suzanne Thompson, Jeff Evans, Bob Feighner, and Brian Cessna passed the FF 1 certification and Deputy Chief Sebetich completed the Fire Officer II certification. A new dry hydrant was installed in the dam near Penn Metals, funding was provided through a grant. July -The Cambria County Fireman’s Convention was held in St. Michael, Team Dauntless won the Grand Champion trophy for the weekly events and also won the Grand Champion Trophy for the best overall appearing fire department in the line of march. The company agrees to purchase their own radio programming software and equipment so that changes can be made more cost effectively. T. J. Feighner was introduced to the membership as a new junior member. Kaza Fire Equipment demonstrated the Turbo Draft to members of Dauntless at the weekly training. Dauntless responded to a well involved house fire at the Miller residence in Crestwood Estates. August – Scott Springer won a $600 scholarship from the Central District Fireman’s Association to be used for school. Congratulations to Scott Springer who was recently hired at Altoona Fire Department and will join former Dauntless members Mike Falchini, Mike Hawksworth and Josh Link. Truck 22-3 took first place in Gallitzin at the Central District Fireman’s Convention. Team Dauntless wins first place in the pumping contest. September – It was voted to look into having a broker seek potential buyers for Snorkel 22-3. Fire Safety drills were conducted at the following facilities: Graystone Apartments, Rebekah Manor, and the Ebensburg Center. Fire/Rescue crews covered the demolition derby events during the Cambria County Fair. October – Fire drill were conducted at the schools with participation from Revloc, Colver and Ebensburg EMS. The fund drive was help during fire prevention week and was a success. Nominations for various conventions were held. November – Nominations were held at the regular monthly meeting. The 2008 budget was accepted by the membership.Crews respond to a MVC with Entrapment at Tibbott’s Pharmacy. Eugene Farabaugh and Carl Schaffer were accepted as regular members of the company. December – The bylaw committee continues work on reviewing and revising the current bylaws, the proposed updates will be presented at the January meeting. A craft fair in conjunction with Dickens Christmas was held at the fire station. Ron Springer congratulated and thanked Dave Roberts for his years of service as police chief and best wishes on his retirement. Terry Wyland was also given encouragement on becoming new Borough police chief and Tony Sebetich was promoted to Assistant chief. The election results were read and the new officers were sworn in by Mayor Charlie Moyer.